This view of Matlock Bank is slightly later in date than the previous image. Firstly, the wing of Bank House Hydro on New Street had been altered. Secondly, there were also new houses on the corner of Lime Grove Walk, New Street and St. Joseph's Street but Bridge House on Bank Road had not been yet transformed into the Town Hall. Higher on the Bank are a couple of properties on Henry Avenue, including the building that was eventually called Golding House. Further to the right along Smedley Street is the Victoria Hall (opened 1896), then the Cavendish School and finally Lilybank (almost hidden and very grey). The cluster of houses closest to the camera and below the field includes properties in Matlock Bridge at the bottom of Snitterton Road and Holt Lane as well as the shops and hotel surrounding Crown Square on the far side of the County Bridge. There was one major development on the Bank in the 1890s that was a life changer for Matlock. This was the construction of the cable tramway that ran for thirty four years and went from the top of Rutland Street, down Bank Road (Dobb Lane) and terminated in Crown Square. It joined the community who lived at or near the top of the Bank with that of Matlock Bridge; there is even a tram waiting in Crown Square to ascend Bank Road. A little later than this picture was taken, in 1897, we learn that the Council used a Refuse Tip on Bank Road. At one of the Council meetings a question arose when the the minutes of the previous meeting were read. It transpired that there had been complaints about the unsightly litter, which is hardly surprising when so much of the town's economy was based on tourism. This tip could have been on land that was later developed into Imperial Gardens and then became the home of the Lido as it was mentioned that the intention was to eventually turn the tip into a park. However, a better location was land opposite Bridge Hall/House, later the Town Hall as in 1898 a rubbish tip was agreed for Starkholmes. Seemingly, up until then all Starkholmes rubbish had been "carted to the Bridge Hall tip". During the early years of Matlock's Conservative Club their officials had purchased a building plot on Bank Road - where the Post Office is today - and intended to erect their own Club on it when funds allowed. Instead of building a Club they eventually bought the Market Hall buildings, making a good profit from the sale of the Bank Road plot. In 1902, whilst this land was undeveloped, the Council's Surveyor asked the secretary of the Conservative Club about terms for tipping refuse onto this land. The Club's secretary, Mr Baker, replied that they were unable to grant the Council's request as surface water now ran off the road over the land belonging to the club. So it seems that a second rubbish tip on Bank Road was sidestepped. Mr. Hodgkinson subsequently built his new Post Office. "Matlock Bank". No publisher, No.677. Posted 10 Dec 1903 in Dewsbury. The card has a divided back. In the collection of and provided by and © Ann Andrews. See Bank Road & the Steep-Gradient Tramway. "Derbyshire Times", 8 May 1897. Refuse Tip, Bank Road. "ibid. ", 6 April 1898. Council Meeting report. The 1898 tip could have been on land to the left of the Town Hall as there is photographic evidence of tipping on land between the Town Hall and what is today Edgefold Road. 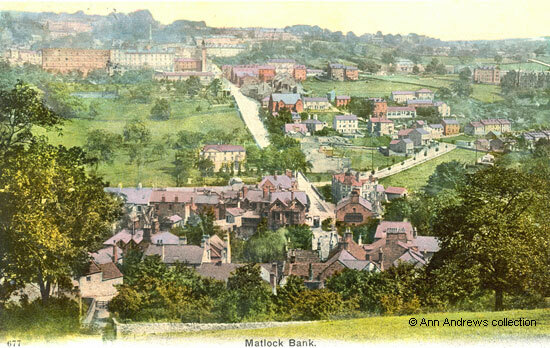 Either look at Matlock from Matlock Bank, 1904-06 or go to 1. Matlock from Matlock Bank in the "Just Images" section and look down the hill. In the image on this page that land is just a green field. "ibid. ", 10 December 1932. Presentation to Mr. Crowder Johnson. "ibid. ", 11 October 1902. Matlock District Council meeting. A Public Tip.